When you ask people where all the great deli's are they usually answer: “New York City!” True, the Big Apple is home to some of the world's legendary delis. But those East Coast transplants living 3,000 miles away in sunny L.A. don't have to sit and be envious (and hungry) anymore. 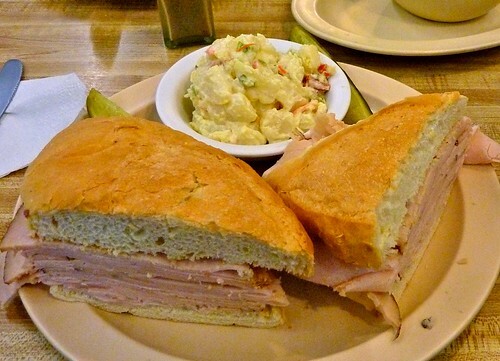 Because, believe it or not, L.A. is a mini mecca for great deli's. It's true. In the past ten years I have tried every deli I've seen (well over 4 dozen) from Hollywood to Palm Springs and back. And some have food that rivals even NYC legends like Katz's and Carnegie Deli. 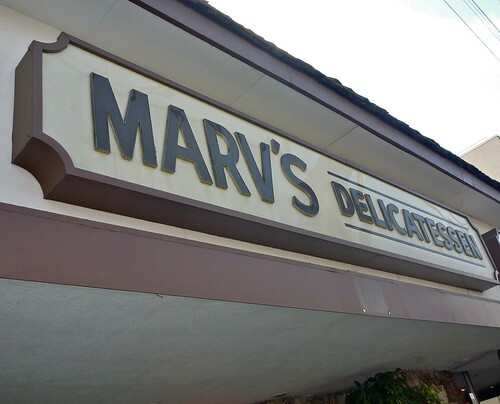 In part one of this three part series I spotlight Marv's Deli, a hidden treasure located on Magnolia Blvd in North Hollywood, CA. But first, what makes a great deli? Number One: It cannot be part of a chain. Sorry, Jerry's Deli, but your multiple locations and “just okay” eats make you the McDonald's of the Brisket set. Number Two: They should serve traditional Jewish food, Matzo Ball Soup, Knishes and the biggest overstuffed sandwiches you've ever seen. Nothing fancy. Number Three: Hip & Trendy not allowed. From decor to wait staff, old, slightly run down and shabby are the gold standard. Great deli's don't care about “Dress Codes” or “Plating.” And they don't take reservations. 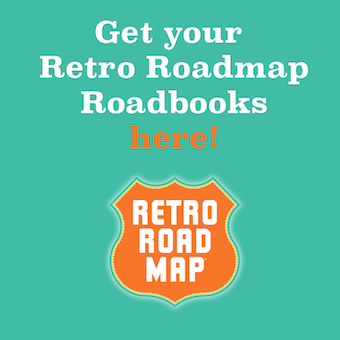 Number Four: If the youngest person in the joint (not counting you and your kids) drove an Edsel, wears hats without being ironic and voted for Ike, then you are in the right place. Finally a great deli should be named after the man or family that started it.And if that person is still alive, they should be in the deli making your food. 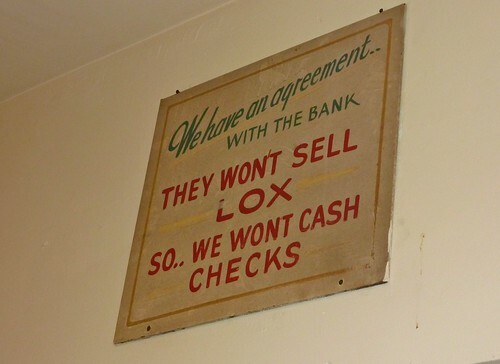 Such is the case with Marv's Deli. First off the place employes only two people--Marv's and his wife Mrs. Marv.No staff. No helpers. Just a man, his lady and his meat.  Gregarious and gravelly voiced, Marv is happy to see you. Quick with a “Hello my friend” Marv actually remembers the folks that frequent his deli. Often asking you questions that pick up the conversation you had a month before. And Mrs. Marv (who's real name I should know after eating there almost 7 years) is sweet and kind. 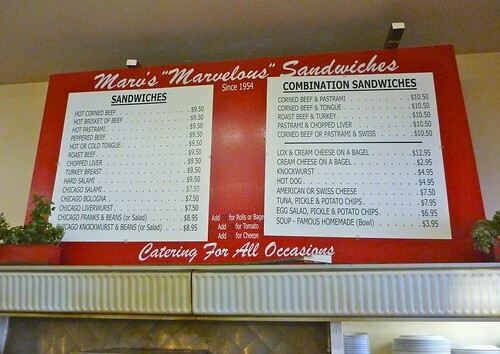 Since 1954 Marv has been happy to hand make you an amazing sandwich. “The usual?” he'll ask. And deliver. The place is simple and unassuming. Unchanged for almost 60 years. 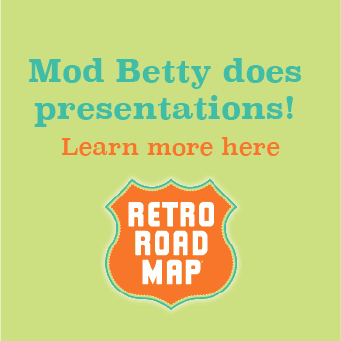 Checkerboard floors, coolers full of bottled sodas, and a display case showing off the various sides, deserts (get a black & white cookie) and the before mentioned meats. Melt in your mouth beef brisket, perfectly seasoned pastrami and juicy turkey are some of my favorites. For this visit I strayed from my usual beef brisket and enjoyed a giant overstuffed turkey sandwich on a super fresh french roll (worth the extra 75 cents) with homemade potato salad and a Doctor Brown's cream soda. All for under $15.00! 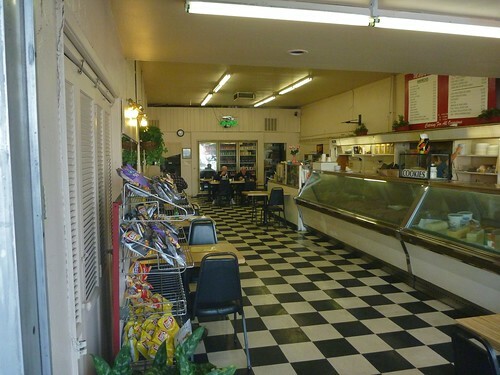 Marv's Deli is a retro-rific must for good eats, good company and a chance to talk with a local legend.